This article is about the astronomical phenomenon. For other uses, see Redshift (disambiguation). Absorption lines in the visible spectrum of a supercluster of distant galaxies (right), as compared to absorption lines in the visible spectrum of the Sun (left). Arrows indicate redshift. Wavelength increases up towards the red and beyond (frequency decreases). In physics, redshift is a phenomenon where electromagnetic radiation (such as light) from an object undergoes an increase in wavelength. Whether or not the radiation is visible, "redshift" means an increase in wavelength, equivalent to a decrease in wave frequency and photon energy, in accordance with, respectively, the wave and quantum theories of light. Neither the emitted nor perceived light is necessarily red; instead, the term refers to the human perception of longer wavelengths as red, which is at the section of the visible spectrum with the longest wavelengths. Examples of redshifting are a gamma ray perceived as an X-ray, or initially visible light perceived as radio waves. The opposite of a redshift is a blueshift, where wavelengths shorten and energy increases. However, redshift is a more common term and sometimes blueshift is referred to as negative redshift. Objects move apart (or closer together) in space. This is an example of the Doppler effect. Space itself expands, causing objects to become separated without changing their positions in space. This is known as cosmological redshift. All sufficiently distant light sources (generally more than a few million light years away) show redshift corresponding to the rate of increase in their distance from Earth, known as Hubble's Law. Gravitational redshift is a relativistic effect observed due to strong gravitational fields, which distort spacetime and exert a force on light and other particles. Knowledge of redshifts and blueshifts has been used to develop several terrestrial technologies such as Doppler radar and radar guns. Redshifts are also seen in the spectroscopic observations of astronomical objects. Its value is represented by the letter z. A special relativistic redshift formula (and its classical approximation) can be used to calculate the redshift of a nearby object when spacetime is flat. However, in many contexts, such as black holes and Big Bang cosmology, redshifts must be calculated using general relativity. Special relativistic, gravitational, and cosmological redshifts can be understood under the umbrella of frame transformation laws. There exist other physical processes that can lead to a shift in the frequency of electromagnetic radiation, including scattering and optical effects; however, the resulting changes are distinguishable from true redshift and are not generally referred to as such (see section on physical optics and radiative transfer). The history of the subject began with the development in the 19th century of wave mechanics and the exploration of phenomena associated with the Doppler effect. The effect is named after Christian Doppler, who offered the first known physical explanation for the phenomenon in 1842. The hypothesis was tested and confirmed for sound waves by the Dutch scientist Christophorus Buys Ballot in 1845. Doppler correctly predicted that the phenomenon should apply to all waves, and in particular suggested that the varying colors of stars could be attributed to their motion with respect to the Earth. Before this was verified, however, it was found that stellar colors were primarily due to a star's temperature, not motion. Only later was Doppler vindicated by verified redshift observations. The first Doppler redshift was described by French physicist Hippolyte Fizeau in 1848, who pointed to the shift in spectral lines seen in stars as being due to the Doppler effect. The effect is sometimes called the "Doppler–Fizeau effect". In 1868, British astronomer William Huggins was the first to determine the velocity of a star moving away from the Earth by this method. In 1871, optical redshift was confirmed when the phenomenon was observed in Fraunhofer lines using solar rotation, about 0.1 Å in the red. In 1887, Vogel and Scheiner discovered the annual Doppler effect, the yearly change in the Doppler shift of stars located near the ecliptic due to the orbital velocity of the Earth. In 1901, Aristarkh Belopolsky verified optical redshift in the laboratory using a system of rotating mirrors. The earliest occurrence of the term red-shift in print (in this hyphenated form) appears to be by American astronomer Walter S. Adams in 1908, in which he mentions "Two methods of investigating that nature of the nebular red-shift". The word does not appear unhyphenated until about 1934 by Willem de Sitter, perhaps indicating that up to that point its German equivalent, Rotverschiebung, was more commonly used. Beginning with observations in 1912, Vesto Slipher discovered that most spiral galaxies, then mostly thought to be spiral nebulae, had considerable redshifts. Slipher first reports on his measurement in the inaugural volume of the Lowell Observatory Bulletin. Three years later, he wrote a review in the journal Popular Astronomy. In it he states that "the early discovery that the great Andromeda spiral had the quite exceptional velocity of –300 km(/s) showed the means then available, capable of investigating not only the spectra of the spirals but their velocities as well." Slipher reported the velocities for 15 spiral nebulae spread across the entire celestial sphere, all but three having observable "positive" (that is recessional) velocities. Subsequently, Edwin Hubble discovered an approximate relationship between the redshifts of such "nebulae" and the distances to them with the formulation of his eponymous Hubble's law. These observations corroborated Alexander Friedmann's 1922 work, in which he derived the Friedmann-Lemaître equations. They are today considered strong evidence for an expanding universe and the Big Bang theory. The spectrum of light that comes from a single source (see idealized spectrum illustration top-right) can be measured. To determine the redshift, one searches for features in the spectrum such as absorption lines, emission lines, or other variations in light intensity. If found, these features can be compared with known features in the spectrum of various chemical compounds found in experiments where that compound is located on Earth. A very common atomic element in space is hydrogen. The spectrum of originally featureless light shone through hydrogen will show a signature spectrum specific to hydrogen that has features at regular intervals. If restricted to absorption lines it would look similar to the illustration (top right). If the same pattern of intervals is seen in an observed spectrum from a distant source but occurring at shifted wavelengths, it can be identified as hydrogen too. If the same spectral line is identified in both spectra—but at different wavelengths—then the redshift can be calculated using the table below. Determining the redshift of an object in this way requires a frequency- or wavelength-range. In order to calculate the redshift one has to know the wavelength of the emitted light in the rest frame of the source, in other words, the wavelength that would be measured by an observer located adjacent to and comoving with the source. Since in astronomical applications this measurement cannot be done directly, because that would require travelling to the distant star of interest, the method using spectral lines described here is used instead. Redshifts cannot be calculated by looking at unidentified features whose rest-frame frequency is unknown, or with a spectrum that is featureless or white noise (random fluctuations in a spectrum). After z is measured, the distinction between redshift and blueshift is simply a matter of whether z is positive or negative. See the formula section below for some basic interpretations that follow when either a redshift or blueshift is observed. For example, Doppler effect blueshifts (z < 0) are associated with objects approaching (moving closer to) the observer with the light shifting to greater energies. Conversely, Doppler effect redshifts (z > 0) are associated with objects receding (moving away) from the observer with the light shifting to lower energies. Likewise, gravitational blueshifts are associated with light emitted from a source residing within a weaker gravitational field as observed from within a stronger gravitational field, while gravitational redshifting implies the opposite conditions. In general relativity one can derive several important special-case formulae for redshift in certain special spacetime geometries, as summarized in the following table. In all cases the magnitude of the shift (the value of z) is independent of the wavelength. Doppler effect, yellow (~575 nm wavelength) ball appears greenish (blueshift to ~565 nm wavelength) approaching observer, turns orange (redshift to ~585 nm wavelength) as it passes, and returns to yellow when motion stops. To observe such a change in color, the object would have to be traveling at approximately 5200 km/s, or about 75 times faster than the speed record for the fastest manmade space probe. where c is the speed of light. In the classical Doppler effect, the frequency of the source is not modified, but the recessional motion causes the illusion of a lower frequency. This phenomenon was first observed in a 1938 experiment performed by Herbert E. Ives and G.R. Stilwell, called the Ives–Stilwell experiment. is measured, even though the object is not moving away from the observer. Even when the source is moving towards the observer, if there is a transverse component to the motion then there is some speed at which the dilation just cancels the expected blueshift and at higher speed the approaching source will be redshifted. In the early part of the twentieth century, Slipher, Hubble and others made the first measurements of the redshifts and blueshifts of galaxies beyond the Milky Way. They initially interpreted these redshifts and blueshifts as due to random motions, but later Hubble discovered a rough correlation between the increasing redshifts and the increasing distance of galaxies. Theorists almost immediately realized that these observations could be explained by a mechanism for producing redshifts seen in certain cosmological solutions to Einstein's equations of general relativity. Hubble's law of the correlation between redshifts and distances is required by all such models that have a metric expansion of space. As a result, the wavelength of photons propagating through the expanding space is stretched, creating the cosmological redshift. There is a distinction between a redshift in cosmological context as compared to that witnessed when nearby objects exhibit a local Doppler-effect redshift. Rather than cosmological redshifts being a consequence of the relative velocities that are subject to the laws of special relativity (and thus subject to the rule that no two locally separated objects can have relative velocities with respect to each other faster than the speed of light), the photons instead increase in wavelength and redshift because of a global feature of the spacetime metric through which they are traveling. One interpretation of this effect is the idea that space itself is expanding. Due to the expansion increasing as distances increase, the distance between two remote galaxies can increase at more than 3×108 m/s, but this does not imply that the galaxies move faster than the speed of light at their present location (which is forbidden by Lorentz covariance). The observational consequences of this effect can be derived using the equations from general relativity that describe a homogeneous and isotropic universe. k is the curvature per unit area. is obtained. In an expanding universe such as the one we inhabit, the scale factor is monotonically increasing as time passes, thus, z is positive and distant galaxies appear redshifted. where H0 is the present-day Hubble constant, and z is the redshift. For cosmological redshifts of z < 0.01 additional Doppler redshifts and blueshifts due to the peculiar motions of the galaxies relative to one another cause a wide scatter from the standard Hubble Law. The resulting situation can be illustrated by the Expanding Rubber Sheet Universe, a common cosmological analogy used to describe the expansion of space. If two objects are represented by ball bearings and spacetime by a stretching rubber sheet, the Doppler effect is caused by rolling the balls across the sheet to create peculiar motion. The cosmological redshift occurs when the ball bearings are stuck to the sheet and the sheet is stretched. The redshifts of galaxies include both a component related to recessional velocity from expansion of the Universe, and a component related to peculiar motion (Doppler shift). The redshift due to expansion of the Universe depends upon the recessional velocity in a fashion determined by the cosmological model chosen to describe the expansion of the Universe, which is very different from how Doppler redshift depends upon local velocity. Describing the cosmological expansion origin of redshift, cosmologist Edward Robert Harrison said, "Light leaves a galaxy, which is stationary in its local region of space, and is eventually received by observers who are stationary in their own local region of space. Between the galaxy and the observer, light travels through vast regions of expanding space. As a result, all wavelengths of the light are stretched by the expansion of space. It is as simple as that..." Steven Weinberg clarified, "The increase of wavelength from emission to absorption of light does not depend on the rate of change of a(t) [here a(t) is the Robertson-Walker scale factor] at the times of emission or absorption, but on the increase of a(t) in the whole period from emission to absorption." Popular literature often uses the expression "Doppler redshift" instead of "cosmological redshift" to describe the redshift of galaxies dominated by the expansion of spacetime, but the cosmological redshift is not found using the relativistic Doppler equation which is instead characterized by special relativity; thus v > c is impossible while, in contrast, v > c is possible for cosmological redshifts because the space which separates the objects (for example, a quasar from the Earth) can expand faster than the speed of light. More mathematically, the viewpoint that "distant galaxies are receding" and the viewpoint that "the space between galaxies is expanding" are related by changing coordinate systems. Expressing this precisely requires working with the mathematics of the Friedmann-Robertson-Walker metric. If the Universe were contracting instead of expanding, we would see distant galaxies blueshifted by an amount proportional to their distance instead of redshifted. This gravitational redshift result can be derived from the assumptions of special relativity and the equivalence principle; the full theory of general relativity is not required. The effect is very small but measurable on Earth using the Mössbauer effect and was first observed in the Pound–Rebka experiment. However, it is significant near a black hole, and as an object approaches the event horizon the red shift becomes infinite. It is also the dominant cause of large angular-scale temperature fluctuations in the cosmic microwave background radiation (see Sachs-Wolfe effect). The redshift observed in astronomy can be measured because the emission and absorption spectra for atoms are distinctive and well known, calibrated from spectroscopic experiments in laboratories on Earth. When the redshift of various absorption and emission lines from a single astronomical object is measured, z is found to be remarkably constant. Although distant objects may be slightly blurred and lines broadened, it is by no more than can be explained by thermal or mechanical motion of the source. For these reasons and others, the consensus among astronomers is that the redshifts they observe are due to some combination of the three established forms of Doppler-like redshifts. Alternative hypotheses and explanations for redshift such as tired light are not generally considered plausible. In nearby objects (within our Milky Way galaxy) observed redshifts are almost always related to the line-of-sight velocities associated with the objects being observed. Observations of such redshifts and blueshifts have enabled astronomers to measure velocities and parametrize the masses of the orbiting stars in spectroscopic binaries, a method first employed in 1868 by British astronomer William Huggins. Similarly, small redshifts and blueshifts detected in the spectroscopic measurements of individual stars are one way astronomers have been able to diagnose and measure the presence and characteristics of planetary systems around other stars and have even made very detailed differential measurements of redshifts during planetary transits to determine precise orbital parameters. Finely detailed measurements of redshifts are used in helioseismology to determine the precise movements of the photosphere of the Sun. Redshifts have also been used to make the first measurements of the rotation rates of planets, velocities of interstellar clouds, the rotation of galaxies, and the dynamics of accretion onto neutron stars and black holes which exhibit both Doppler and gravitational redshifts. Additionally, the temperatures of various emitting and absorbing objects can be obtained by measuring Doppler broadening – effectively redshifts and blueshifts over a single emission or absorption line. By measuring the broadening and shifts of the 21-centimeter hydrogen line in different directions, astronomers have been able to measure the recessional velocities of interstellar gas, which in turn reveals the rotation curve of our Milky Way. Similar measurements have been performed on other galaxies, such as Andromeda. As a diagnostic tool, redshift measurements are one of the most important spectroscopic measurements made in astronomy. The most distant objects exhibit larger redshifts corresponding to the Hubble flow of the Universe. The largest observed redshift, corresponding to the greatest distance and furthest back in time, is that of the cosmic microwave background radiation; the numerical value of its redshift is about z = 1089 (z = 0 corresponds to present time), and it shows the state of the Universe about 13.8 billion years ago, and 379,000 years after the initial moments of the Big Bang. The luminous point-like cores of quasars were the first "high-redshift" (z > 0.1) objects discovered before the improvement of telescopes allowed for the discovery of other high-redshift galaxies. For galaxies more distant than the Local Group and the nearby Virgo Cluster, but within a thousand megaparsecs or so, the redshift is approximately proportional to the galaxy's distance. This correlation was first observed by Edwin Hubble and has come to be known as Hubble's law. Vesto Slipher was the first to discover galactic redshifts, in about the year 1912, while Hubble correlated Slipher's measurements with distances he measured by other means to formulate his Law. In the widely accepted cosmological model based on general relativity, redshift is mainly a result of the expansion of space: this means that the farther away a galaxy is from us, the more the space has expanded in the time since the light left that galaxy, so the more the light has been stretched, the more redshifted the light is, and so the faster it appears to be moving away from us. Hubble's law follows in part from the Copernican principle. Because it is usually not known how luminous objects are, measuring the redshift is easier than more direct distance measurements, so redshift is sometimes in practice converted to a crude distance measurement using Hubble's law. Gravitational interactions of galaxies with each other and clusters cause a significant scatter in the normal plot of the Hubble diagram. The peculiar velocities associated with galaxies superimpose a rough trace of the mass of virialized objects in the Universe. This effect leads to such phenomena as nearby galaxies (such as the Andromeda Galaxy) exhibiting blueshifts as we fall towards a common barycenter, and redshift maps of clusters showing a Fingers of God effect due to the scatter of peculiar velocities in a roughly spherical distribution. This added component gives cosmologists a chance to measure the masses of objects independent of the mass to light ratio (the ratio of a galaxy's mass in solar masses to its brightness in solar luminosities), an important tool for measuring dark matter. The Hubble law's linear relationship between distance and redshift assumes that the rate of expansion of the Universe is constant. However, when the Universe was much younger, the expansion rate, and thus the Hubble "constant", was larger than it is today. For more distant galaxies, then, whose light has been travelling to us for much longer times, the approximation of constant expansion rate fails, and the Hubble law becomes a non-linear integral relationship and dependent on the history of the expansion rate since the emission of the light from the galaxy in question. Observations of the redshift-distance relationship can be used, then, to determine the expansion history of the Universe and thus the matter and energy content. While it was long believed that the expansion rate has been continuously decreasing since the Big Bang, recent observations of the redshift-distance relationship using Type Ia supernovae have suggested that in comparatively recent times the expansion rate of the Universe has begun to accelerate. 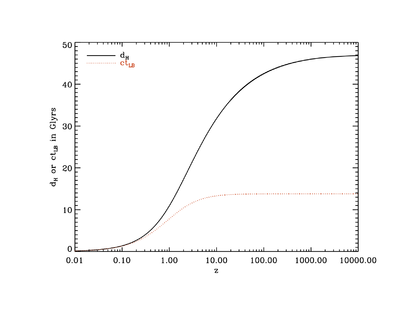 Plot of distance (in giga light-years) vs. redshift according to the Lambda-CDM model. dH (in solid black) is the comoving distance from Earth to the location with the Hubble redshift z while ctLB (in dotted red) is the speed of light multiplied by the lookback time to Hubble redshift z. The comoving distance is the physical space-like distance between here and the distant location, asymptoting to the size of the observable universe at some 47 billion light years. The lookback time is the distance a photon traveled from the time it was emitted to now divided by the speed of light, with a maximum distance of 13.8 billion light years corresponding to the age of the universe. Extremely red objects (EROs) are astronomical sources of radiation that radiate energy in the red and near infrared part of the electromagnetic spectrum. These may be starburst galaxies that have a high redshift accompanied by reddening from intervening dust, or they could be highly redshifted elliptical galaxies with an older (and therefore redder) stellar population. Objects that are even redder than EROs are termed hyper extremely red objects (HEROs). The cosmic microwave background has a redshift of z = 1089, corresponding to an age of approximately 379,000 years after the Big Bang and a comoving distance of more than 46 billion light years. The yet-to-be-observed first light from the oldest Population III stars, not long after atoms first formed and the CMB ceased to be absorbed almost completely, may have redshifts in the range of 20 < z < 100. Other high-redshift events predicted by physics but not presently observable are the cosmic neutrino background from about two seconds after the Big Bang (and a redshift in excess of z > 1010) and the cosmic gravitational wave background emitted directly from inflation at a redshift in excess of z > 1025. With advent of automated telescopes and improvements in spectroscopes, a number of collaborations have been made to map the Universe in redshift space. By combining redshift with angular position data, a redshift survey maps the 3D distribution of matter within a field of the sky. These observations are used to measure properties of the large-scale structure of the Universe. The Great Wall, a vast supercluster of galaxies over 500 million light-years wide, provides a dramatic example of a large-scale structure that redshift surveys can detect. The first redshift survey was the CfA Redshift Survey, started in 1977 with the initial data collection completed in 1982. More recently, the 2dF Galaxy Redshift Survey determined the large-scale structure of one section of the Universe, measuring redshifts for over 220,000 galaxies; data collection was completed in 2002, and the final data set was released 30 June 2003. The Sloan Digital Sky Survey (SDSS), is ongoing as of 2013 and aims to measure the redshifts of around 3 million objects. SDSS has recorded redshifts for galaxies as high as 0.8, and has been involved in the detection of quasars beyond z = 6. The DEEP2 Redshift Survey uses the Keck telescopes with the new "DEIMOS" spectrograph; a follow-up to the pilot program DEEP1, DEEP2 is designed to measure faint galaxies with redshifts 0.7 and above, and it is therefore planned to provide a high redshift complement to SDSS and 2dF. The interactions and phenomena summarized in the subjects of radiative transfer and physical optics can result in shifts in the wavelength and frequency of electromagnetic radiation. In such cases, the shifts correspond to a physical energy transfer to matter or other photons rather than being by a transformation between reference frames. Such shifts can be from such physical phenomena as coherence effects or the scattering of electromagnetic radiation whether from charged elementary particles, from particulates, or from fluctuations of the index of refraction in a dielectric medium as occurs in the radio phenomenon of radio whistlers. While such phenomena are sometimes referred to as "redshifts" and "blueshifts", in astrophysics light-matter interactions that result in energy shifts in the radiation field are generally referred to as "reddening" rather than "redshifting" which, as a term, is normally reserved for the effects discussed above. In many circumstances scattering causes radiation to redden because entropy results in the predominance of many low-energy photons over few high-energy ones (while conserving total energy). Except possibly under carefully controlled conditions, scattering does not produce the same relative change in wavelength across the whole spectrum; that is, any calculated z is generally a function of wavelength. Furthermore, scattering from random media generally occurs at many angles, and z is a function of the scattering angle. If multiple scattering occurs, or the scattering particles have relative motion, then there is generally distortion of spectral lines as well. 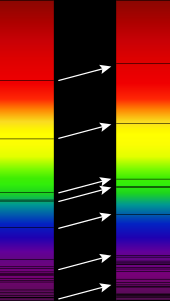 In interstellar astronomy, visible spectra can appear redder due to scattering processes in a phenomenon referred to as interstellar reddening – similarly Rayleigh scattering causes the atmospheric reddening of the Sun seen in the sunrise or sunset and causes the rest of the sky to have a blue color. This phenomenon is distinct from redshifting because the spectroscopic lines are not shifted to other wavelengths in reddened objects and there is an additional dimming and distortion associated with the phenomenon due to photons being scattered in and out of the line-of-sight. For a list of scattering processes, see Scattering. ^ See Feynman, Leighton and Sands (1989) or any introductory undergraduate (and many high school) physics textbooks. See Taylor (1992) for a relativistic discussion. ^ a b c d e f g h i j See Binney and Merrifeld (1998), Carroll and Ostlie (1996), Kutner (2003) for applications in astronomy. ^ Doppler, Christian (1846). Beiträge zur fixsternenkunde. 69. Prague: G. Haase Söhne. Bibcode:1846befi.book.....D.
^ Maulik, Dev (2005). "Doppler Sonography: A Brief History". In Maulik, Dev; Zalud, Ivica (eds.). Doppler Ultrasound in Obstetrics And Gynecology. Springer. ISBN 978-3-540-23088-5. ^ O'Connor, John J.; Robertson, Edmund F. (1998). "Christian Andreas Doppler". MacTutor History of Mathematics archive. University of St Andrews. ^ a b Huggins, William (1868). "Further Observations on the Spectra of Some of the Stars and Nebulae, with an Attempt to Determine Therefrom Whether These Bodies are Moving towards or from the Earth, Also Observations on the Spectra of the Sun and of Comet II". Philosophical Transactions of the Royal Society of London. 158: 529–564. Bibcode:1868RSPT..158..529H. doi:10.1098/rstl.1868.0022. ^ Reber, G. (1995). "Intergalactic Plasma". Astrophysics and Space Science. 227 (1–2): 93–96. Bibcode:1995Ap&SS.227...93R. doi:10.1007/BF00678069. ^ Pannekoek, A (1961). A History of Astronomy. Dover. p. 451. ISBN 978-0-486-65994-7. ^ Bélopolsky, A. (1901). "On an Apparatus for the Laboratory Demonstration of the Doppler-Fizeau Principle". Astrophysical Journal. 13: 15. Bibcode:1901ApJ....13...15B. doi:10.1086/140786. ^ Adams, Walter S. (1908). "Preliminary catalogue of lines affected in sun-spots". Contributions from the Mount Wilson Observatory / Carnegie Institution of Washington. Contributions from the Solar Observatory of the Carnegie Institution of Washington: Carnegie Institution of Washington. 22: 1–21. Bibcode:1908CMWCI..22....1A. Reprinted in Adams, Walter S. (1908). "Preliminary Catalogue of Lines Affected in Sun-Spots Region λ 4000 TO λ 4500". Astrophysical Journal. 27: 45. Bibcode:1908ApJ....27...45A. doi:10.1086/141524. ^ Slipher, Vesto (1915). "Spectrographic Observations of Nebulae". Popular Astronomy. 23: 21–24. Bibcode:1915PA.....23...21S. ^ Slipher, Vesto (1915). "Spectrographic Observations of Nebulae". Popular Astronomy. 23: 22. Bibcode:1915PA.....23...21S. ^ Hubble, Edwin (1929). "A Relation between Distance and Radial Velocity among Extra-Galactic Nebulae". Proceedings of the National Academy of Sciences of the United States of America. 15 (3): 168–173. Bibcode:1929PNAS...15..168H. doi:10.1073/pnas.15.3.168. PMC 522427. PMID 16577160. ^ "Hubble census finds galaxies at redshifts 9 to 12". ESA/Hubble Press Release. Retrieved 13 December 2012. ^ See, for example, this 25 May 2004 press release from NASA's Swift space telescope that is researching gamma-ray bursts: "Measurements of the gamma-ray spectra obtained during the main outburst of the GRB have found little value as redshift indicators, due to the lack of well-defined features. However, optical observations of GRB afterglows have produced spectra with identifiable lines, leading to precise redshift measurements." ^ See  for a tutorial on how to define and interpret large redshift measurements. ^ Ives, H.; Stilwell, G. (1938). "An Experimental study of the rate of a moving atomic clock". J. Opt. Soc. Am. 28 (7): 215–226. doi:10.1364/josa.28.000215. ^ Freund, Jurgen (2008). Special Relativity for Beginners. World Scientific. p. 120. ISBN 978-981-277-160-5. ^ Ditchburn, R (1961). Light. Dover. p. 329. ISBN 978-0-12-218101-6. ^ Steven Weinberg (1993). The First Three Minutes: A Modern View of the Origin of the Universe (2nd ed.). Basic Books. p. 34. ISBN 978-0-465-02437-7. ^ Lars Bergström; Ariel Goobar (2006). Cosmology and Particle Astrophysics (2nd ed.). Springer. p. 77, Eq.4.79. ISBN 978-3-540-32924-4. ^ M.S. Longair (1998). Galaxy Formation. Springer. p. 161. ISBN 978-3-540-63785-1. ^ Yu N Parijskij (2001). "The High Redshift Radio Universe". In Norma Sanchez (ed.). Current Topics in Astrofundamental Physics. Springer. p. 223. ISBN 978-0-7923-6856-4. ^ Measurements of the peculiar velocities out to 5 Mpc using the Hubble Space Telescope were reported in 2003 by Karachentsev; et al. (2003). "Local galaxy flows within 5 Mpc". Astronomy and Astrophysics. 398 (2): 479–491. arXiv:astro-ph/0211011. Bibcode:2003A&A...398..479K. doi:10.1051/0004-6361:20021566. ^ Theo Koupelis; Karl F. Kuhn (2007). In Quest of the Universe (5th ed.). Jones & Bartlett Publishers. p. 557. ISBN 978-0-7637-4387-1. ^ "It is perfectly valid to interpret the equations of relativity in terms of an expanding space. The mistake is to push analogies too far and imbue space with physical properties that are not consistent with the equations of relativity." Geraint F. Lewis; Francis, Matthew J.; Barnes, Luke A.; Kwan, Juliana; et al. (2008). "Cosmological Radar Ranging in an Expanding Universe". Monthly Notices of the Royal Astronomical Society. 388 (3): 960–964. arXiv:0805.2197. Bibcode:2008MNRAS.388..960L. doi:10.1111/j.1365-2966.2008.13477.x. ^ Michal Chodorowski (2007). "Is space really expanding? A counterexample". Concepts Phys. 4 (1): 17–34. arXiv:astro-ph/0601171. Bibcode:2007ONCP....4...15C. doi:10.2478/v10005-007-0002-2. ^ Edward Harrison (1992). "The redshift-distance and velocity-distance laws". Astrophysical Journal, Part 1. 403: 28–31. Bibcode:1993ApJ...403...28H. doi:10.1086/172179. . A pdf file can be found here . ^ Harrison 2000, p. 315. ^ Steven Weinberg (2008). Cosmology. Oxford University Press. p. 11. ISBN 978-0-19-852682-7. ^ Speed faster than light is allowed because the expansion of the spacetime metric is described by general relativity in terms of sequences of only locally valid inertial frames as opposed to a global Minkowski metric. Expansion faster than light is an integrated effect over many local inertial frames and is allowed because no single inertial frame is involved. The speed-of-light limitation applies only locally. See Michal Chodorowski (2007). "Is space really expanding? A counterexample". Concepts Phys. 4: 17–34. arXiv:astro-ph/0601171. Bibcode:2007ONCP....4...15C. doi:10.2478/v10005-007-0002-2. which yields solutions where certain objects that "recede" are blueshifted and other objects that "approach" are redshifted. For more on this bizarre result see Davis, T. M., Lineweaver, C. H., and Webb, J. K. "Solutions to the tethered galaxy problem in an expanding universe and the observation of receding blueshifted objects", American Journal of Physics (2003), 71 358–364. ^ Chant, C. A. (1930). "Notes and Queries (Telescopes and Observatory Equipment – The Einstein Shift of Solar Lines)". Journal of the Royal Astronomical Society of Canada. 24: 390. Bibcode:1930JRASC..24..390C. ^ Pound, R.; Rebka, G. (1960). "Apparent Weight of Photons". Physical Review Letters. 4 (7): 337–341. Bibcode:1960PhRvL...4..337P. doi:10.1103/PhysRevLett.4.337. . This paper was the first measurement. ^ Sachs, R. K.; Wolfe, A. M. (1967). "Perturbations of a cosmological model and angular variations of the cosmic microwave background". Astrophysical Journal. 147 (73): 73. Bibcode:1967ApJ...147...73S. doi:10.1086/148982. ^ Brill, Dieter (19 January 2012). "Black Hole Horizons and How They Begin". Astronomical Review. 7 (1): 25–35. Bibcode:2012AstRv...7a..25B. doi:10.1080/21672857.2012.11519694. ^ Bolzonella, M.; Miralles, J.-M.; Pelló, R., Photometric redshifts based on standard SED fitting procedures, Astronomy and Astrophysics, 363, p.476–492 (2000). ^ A pedagogical overview of the K-correction by David Hogg and other members of the SDSS collaboration can be found at astro-ph. ^ The Exoplanet Tracker is the newest observing project to use this technique, able to track the redshift variations in multiple objects at once, as reported in Ge, Jian; Van Eyken, Julian; Mahadevan, Suvrath; Dewitt, Curtis; et al. (2006). "The First Extrasolar Planet Discovered with a New‐Generation High‐Throughput Doppler Instrument". The Astrophysical Journal. 648 (1): 683–695. arXiv:astro-ph/0605247. Bibcode:2006ApJ...648..683G. doi:10.1086/505699. ^ Libbrecht, Keng (1988). "Solar and stellar seismology". Space Science Reviews. 47 (3–4): 275–301. Bibcode:1988SSRv...47..275L. doi:10.1007/BF00243557. ^ In 1871 Hermann Carl Vogel measured the rotation rate of Venus. Vesto Slipher was working on such measurements when he turned his attention to spiral nebulae. ^ An early review by Oort, J. H. on the subject: Oort, J. H. (1970). "The formation of galaxies and the origin of the high-velocity hydrogen". Astronomy and Astrophysics. 7: 381. Bibcode:1970A&A.....7..381O. ^ Asaoka, Ikuko (1989). "X-ray spectra at infinity from a relativistic accretion disk around a Kerr black hole". Publications of the Astronomical Society of Japan. 41 (4): 763–778. Bibcode:1989PASJ...41..763A. ^ "Cosmic Detectives". The European Space Agency (ESA). 2013-04-02. Retrieved 2013-04-25. ^ An accurate measurement of the cosmic microwave background was achieved by the COBE experiment. The final published temperature of 2.73 K was reported in this paper: Fixsen, D. J.; Cheng, E. S.; Cottingham, D. A.; Eplee, R. E., Jr.; Isaacman, R. B.; Mather, J. C.; Meyer, S. S.; Noerdlinger, P. D.; Shafer, R. A.; Weiss, R.; Wright, E. L.; Bennett, C. L.; Boggess, N. W.; Kelsall, T.; Moseley, S. H.; Silverberg, R. F.; Smoot, G. F.; Wilkinson, D. T.. (1994). "Cosmic microwave background dipole spectrum measured by the COBE FIRAS instrument", Astrophysical Journal, 420, 445. The most accurate measurement as of 2006 was achieved by the WMAP experiment. ^ a b Peebles (1993). ^ Binney, James; Scott Treimane (1994). Galactic dynamics. Princeton University Press. ISBN 978-0-691-08445-9. ^ Oesch, P. A.; Brammer, G.; van Dokkum, P.; et al. (March 1, 2016). "A Remarkably Luminous Galaxy at z=11.1 Measured with Hubble Space Telescope Grism Spectroscopy". The Astrophysical Journal. 819 (2): 129. arXiv:1603.00461. Bibcode:2016ApJ...819..129O. doi:10.3847/0004-637X/819/2/129. ^ M.D.Lehnert; Nesvadba, NP; Cuby, JG; Swinbank, AM; et al. (2010). "Spectroscopic Confirmation of a galaxy at redshift z = 8.6". Nature. 467 (7318): 940–942. arXiv:1010.4312. Bibcode:2010Natur.467..940L. doi:10.1038/nature09462. PMID 20962840. ^ Watson, Darach; Christensen, Lise; Knudsen, Kirsten Kraiberg; Richard, Johan; Gallazzi, Anna; Michałowski, Michał Jerzy (2015). "A dusty, normal galaxy in the epoch of reionization". Nature. 519 (7543): 327–330. arXiv:1503.00002. Bibcode:2015Natur.519..327W. doi:10.1038/nature14164. PMID 25731171. ^ Bradley, L.; et al. (2008). "Discovery of a Very Bright Strongly Lensed Galaxy Candidate at z ~ 7.6". The Astrophysical Journal. 678 (2): 647–654. arXiv:0802.2506. Bibcode:2008ApJ...678..647B. doi:10.1086/533519. ^ Egami, E.; et al. (2005). "Spitzer and Hubble Space Telescope Constraints on the Physical Properties of the z~7 Galaxy Strongly Lensed by A2218". The Astrophysical Journal. 618 (1): L5–L8. arXiv:astro-ph/0411117. Bibcode:2005ApJ...618L...5E. doi:10.1086/427550. ^ Salvaterra, R.; Valle, M. Della; Campana, S.; Chincarini, G.; et al. (2009). "GRB 090423 reveals an exploding star at the epoch of re-ionization". Nature. 461 (7268): 1258–60. arXiv:0906.1578. Bibcode:2009Natur.461.1258S. doi:10.1038/nature08445. PMID 19865166. ^ "Scientists observe supermassive black hole in infant universe". phys.org. ^ Klamer, I. J.; Ekers, R. D.; Sadler, E. M.; Weiss, A.; et al. (2005). "CO (1-0) and CO (5-4) Observations of the Most Distant Known Radio Galaxy atz = 5.2". The Astrophysical Journal. 621 (1): L1–L4. arXiv:astro-ph/0501447. Bibcode:2005ApJ...621L...1K. doi:10.1086/429147. ^ Walter, Fabian; Bertoldi, Frank; Carilli, Chris; Cox, Pierre; et al. (2003). "Molecular gas in the host galaxy of a quasar at redshift z = 6.42". Nature. 424 (6947): 406–8. arXiv:astro-ph/0307410. Bibcode:2003Natur.424..406W. doi:10.1038/nature01821. PMID 12879063. ^ Smail, Ian; Owen, F. N.; Morrison, G. E.; Keel, W. C.; et al. (2002). "The Diversity of Extremely Red Objects". The Astrophysical Journal. 581 (2): 844–864. arXiv:astro-ph/0208434. Bibcode:2002ApJ...581..844S. doi:10.1086/344440. ^ Totani, Tomonori; Yoshii, Yuzuru; Iwamuro, Fumihide; Maihara, Toshinori; et al. (2001). "Hyper Extremely Red Objects in the Subaru Deep Field: Evidence for Primordial Elliptical Galaxies in the Dusty Starburst Phase". The Astrophysical Journal. 558 (2): L87–L91. arXiv:astro-ph/0108145. Bibcode:2001ApJ...558L..87T. doi:10.1086/323619. ^ Lineweaver, Charles; Tamara M. Davis (2005). "Misconceptions about the Big Bang". Scientific American. Scientific American. 292 (3): 36–45. Bibcode:2005SciAm.292c..36L. doi:10.1038/scientificamerican0305-36. ^ Naoz, S.; Noter, S.; Barkana, R. (2006). "The first stars in the Universe". Monthly Notices of the Royal Astronomical Society: Letters. 373 (1): L98–L102. arXiv:astro-ph/0604050. Bibcode:2006MNRAS.373L..98N. doi:10.1111/j.1745-3933.2006.00251.x. ^ Lesgourgues, J; Pastor, S (2006). "Massive neutrinos and cosmology". Physics Reports. 429 (6): 307–379. arXiv:astro-ph/0603494. Bibcode:2006PhR...429..307L. doi:10.1016/j.physrep.2006.04.001. ^ Grishchuk, Leonid P (2005). "Relic gravitational waves and cosmology". Physics-Uspekhi. 48 (12): 1235–1247. arXiv:gr-qc/0504018. Bibcode:2005PhyU...48.1235G. doi:10.1070/PU2005v048n12ABEH005795. ^ See the official CfA website for more details. ^ Marc Davis; DEEP2 collaboration (2002). "Science objectives and early results of the DEEP2 redshift survey". Conference on Astronomical Telescopes and Instrumentation, Waikoloa, Hawaii, 22–28 Aug 2002. arXiv:astro-ph/0209419. Bibcode:2003SPIE.4834..161D. doi:10.1117/12.457897. Nussbaumer, Harry; Lydia Bieri (2009). Discovering the Expanding Universe. Cambridge University Press. ISBN 978-0-521-51484-2. Binney, James; Michael Merrifeld (1998). Galactic Astronomy. Princeton University Press. ISBN 978-0-691-02565-0. Carroll, Bradley W. & Dale A. Ostlie (1996). An Introduction to Modern Astrophysics. Addison-Wesley Publishing Company, Inc. ISBN 978-0-201-54730-6. Feynman, Richard; Leighton, Robert; Sands, Matthew (1989). Feynman Lectures on Physics. Vol. 1. Addison-Wesley. ISBN 978-0-201-51003-4. Kutner, Marc (2003). Astronomy: A Physical Perspective. Cambridge University Press. ISBN 978-0-521-52927-3. Misner, Charles; Thorne, Kip S.; Wheeler, John Archibald (1973). Gravitation. San Francisco: W. H. Freeman. ISBN 978-0-7167-0344-0. Peebles, P. J. E. (1993). Principles of Physical Cosmology. Princeton University Press. ISBN 978-0-691-01933-8. Taylor, Edwin F.; Wheeler, John Archibald (1992). Spacetime Physics: Introduction to Special Relativity (2nd ed.). W.H. Freeman. ISBN 978-0-7167-2327-1. Weinberg, Steven (1971). Gravitation and Cosmology. John Wiley. ISBN 978-0-471-92567-5. See also physical cosmology textbooks for applications of the cosmological and gravitational redshifts. Wikimedia Commons has media related to Redshift. Look up redshift in Wiktionary, the free dictionary. Merrifield, Michael; Hill, Richard (2009). "Z Redshift". SIXTψ SYMBΦLS. Brady Haran for the University of Nottingham.